15th day of the 10th lunar month of 1872: born in Tôkyô in the district of Shiba Takanawa. His father, Okamoto Keinosuke, was a samurai serving the Tokugawa Household (afterwards, he worked at the British Embassy in Tôkyô). January 1902: premiere at the Kabukiza of Kidô's first staged drama, which is entitled "Kogane no Shachihoko Uwasa no Takanami" and stars Nakamura Shikan V, Ichikawa Yaozô VII and Ichimura Kakitsu VI. September 1908: premiere at the Meijiza of the Kidô's drama "Ishin Zengo", which stars Ichikawa Sadanji II; this is Kidô first commercial success. May 1911: premiere at the Meijiza of the Kidô's drama "Shuzenji Monogatari" [casting]. October 1911: premiere at the Meijiza of the Kidô's drama "Minowa no Shinjû" [casting]. April 1912: premiere at the Naniwaza of Kidô's "Heikegani", which stars Onoe Baikô VI and Sawamura Sôjûrô VII. October 1914: premiere at the Shintomiza of Okamoto Kidô's drama "Sasaki Takatsuna"; the role of Sasaki Takatsuna is played by Ichikawa Sadanji II. October 1914: premiere at the Meijiza of Okamoto Kidô's drama "Soga Monogatari" [casting]. September 1915: premiere at the Hongôza of Okamoto Kidô's drama "Toribeyama Shinjû" [casting]. February 1916: premiere at the Hongôza of Okamoto Kidô's drama "Banchô Sarayashiki" [casting]. September 1918: premiere at the Meijiza of Okamoto Kidô's drama "Onoe Idahachi" [casting]. November 1920: premiere at the Meijiza of Okamoto Kidô's drama "Ogurusu no Chôbê" [casting]. October 1921: premiere at the Kabukiza of Okamoto Kidô's drama "Ôsakajô"; the leading role of Lady Yodo (Yodogimi) is played by Nakamura Utaemon V.
July 1926: premiere at the Kabukiza of Okamoto Kidô's drama "Gonza to Sukejû" [casting]. 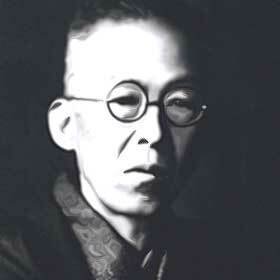 1 March 1939: Okamoto Kidô dies in Tôkyô. October 1995: premiere at the Kabukiza of the drama "Ningen Banji Mawari Tôrô", based on a comical torimonochô written by Okamoto Kidô, starring Nakamura Kankurô V in the main role. Okamoto Kidô was a prolific playwright and novelist, who achieved fame for himself during the first half of the 20th century. "During the middle part of Meiji, Okamoto Kidô began to write for the Tôkyô stage, and is regarded as the representative modern playwright, both for the number and variety of his successes. He is a most indefatigable worker, and several of his new pieces are produced yearly. One of his favourite themes is the persecution of the early Christian converts in Japan,--and he has written a number of plays concerning these martyrs. An Okamoto play that is often repeated, and is certainly one of his best, is "Shuzenji Monogatari", showing the high regard in which the artisans of Old Japan held their work. It expresses Kabuki's love of the Spartan spirit, when the daughter of the mask-maker returns home in a dying condition, after attempting to protect the Shôgun from attack, and her face inspires her father to execute a masterpiece."